Posted 6th October 2015, by John Aves. 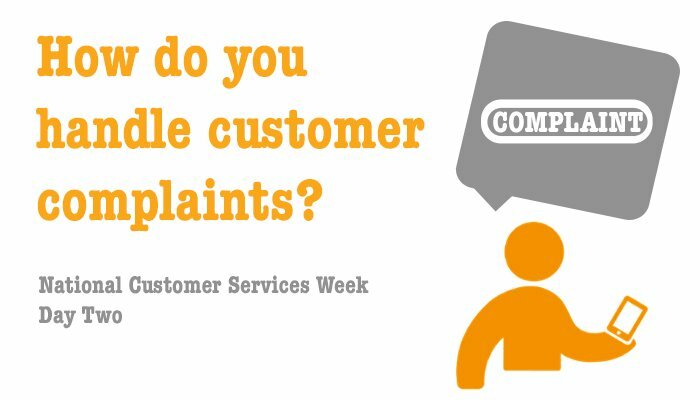 It is National Customer Services Week #NCSW2015, a week long opportunity to promote customer service and the vital role it plays in business growth. Today’s topic is Customer Complaints and handling them to achieve the best outcome. With the advent of social media, customers are more powerful than they have ever been. The story of Dave Carroll, the Canadian musician who’s guitar was broken when he was travelling on United Airlines illustrates what can happen when a customer’s complaint is ignored and anger turns to outrage. Dave Carroll wrote a song – United Breaks Guitars – posted it on YouTube and to date 15 million people have viewed it. Four days after the video was posted United’s stock price dropped 10% costing shareholders an estimated $180 million. So managing feedback from customers about what has not gone well matters!! Here are a few golden rules. They sound obvious – common sense – but sadly all too often they are not common practice. These golden rules apply whether the contact with the customer is face to face, over the phone or in writing. Show empathy. Acknowledging the customer’s right to be angry, disappointed or frustrated is an important first step in turning an unhappy customer around. Respecting the customers right to be angry does not mean the customer is right. They may be wrong but telling they are wrong and not demonstrating empathy with their situation will not get the conversation off to a good start. Let the customer dictate the pace. Customers often feel better once they have had the chance to express their annoyance so allowing them to dictate the pace of the conversation is important. Resist the temptation to interrupt them to try to solve their problem even if you know how to. Enabling them to feel in control helps the customer feel better about their situation. Listening. Demonstrating you have heard what the customer has to say – whether face to face or in writing is also critical. I am sure many of us have experienced the frustration of writing to a company and receiving a reply that does not acknowledge the points made in our original letter or email. I was annoyed before but now I am really angry because I feel I have got to start again to make you understand the source of my dissatisfaction. Avoid assigning blame. Nothing irritates a customer more than being told it is ‘company policy.’ Blaming policy, the company, a colleague or worse still the customer is only likely to make matters worse. Solve the problem. Once you have done all of this, solve the customer’s problem or get someone else who can. Dealing with difficult customer situations can be one of the most stressful aspects of a person’s role. And often dealing with upset, angry or frustrated customers falls to someone fairly junior in the organisational hierarchy. In organisations that have understood how important customers are and how critical it is to deal with customer dis-satisfaction often involve senior executives in the process of talking to customers on a regular basis. Role modeling in this way sends a big signal about what is important. The other investment we see leading organisations make is in the training of their people. If customer service staff are not equipped with the skills on how to best handle these emotionally charged situations, they may well resort to a ‘fight or flight’ response, which can cause an already tense situation to spiral out of control. The danger is that a customer who started off a little annoyed becomes so angry that they vow never to buy from the company again. Result – a customer lost for life. Employee training is key to complaint handling. Ensuring staff at all levels know how to handle their emotions, take time to stop, think and pause, to compose themselves before speaking. Then it is about using positive body language, tone and words to turn a situation around. These are skills that that need to be taught and only thrive in an environment where employees know they are supported in solving problems for customers before they get to the complaint status. The investment in training employees to positively engage with customers, is a so called ‘soft skill’ that can make a big difference to the bottom line.